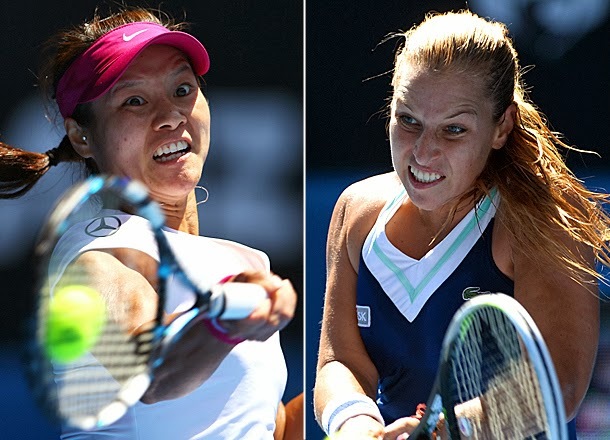 This is my prediction post for the 2014 Australian Open Women's final. Last year I incorrectly predicted that Li Na would beat Victoria Azarenka in the final. (I also incorrectly predicted Maria Sharapova would beat Azarenka in the final the year before.) This year I have correctly predicted 1 of 2 women's semifinals and 1 of 4 women's quarterfinals. I also correctly predicted 1 of 2 men's semifinals and 1 of 4 men's quarterfinals this year. Na Li (CHN)  d. Eugenie Bouchard (CAN)  6-2 6-4. This is the semifinal result that I did correctly predict. Li Na was up 5-0 in the first set and looked like she was going to run away with the first set since the teenaged Bouchard had trouble winning points at the beginning of the match. However, after breaking Li for the first time when she was serving for the set, Bouchard settled down and made a match of it. Even so, Li Na's was able to hold on and finally earned a break and served out the match to reach her 4th major final. Dominika Cibulkova (SVK)  d. Agnieszka Radwanska (POL)  6-1 6-2. Even though I had reveled in her powerful dismissal of Maria Sharapova I did not believe that Cibulkova could maintain her level of play for another match, especially against the wily Radwanska. The Polish seed is known for her ability to counteract power and had demonstrated that fact in her surprising win over 2-time Australian Open champion Azarenka in the quarterfinals. However, it is also true that Radwanska can be blasted off the court and this is what Cibulkova was able to do. This is not as easy as it looks because it requires a combination of both power and precision but it looks like Cibulkova may have figured out how to do this. Na Li (CHN)  vs. Dominika Cibulkova (SVK) . Some people think that this match may be a bit of a mismatch because first-time finalists are often overwhelmed. Additionally, it is true that Li has an undefeated 4-0 record against Cibulkova which does not bode well for Cibulkova's chances of winning her first final. However, Cibulkova has been able to demonstrate mental toughness in the tournament primarily because she has has built up huge leads in most of her matches (except for the Sharapova match, where it should be noted that she built up big leads and then almost blew them). It is doubtful that she will enjoy such a huge lead against Li and even if she does it also doubtful she will be able to hold on to them. The main reason why I believe that Li will win her 2nd major here is that she is now mentally tougher with the addition of Justine Henin's former coach Carlos Rodriguez as her permanent coach. He has been able to control the Chinese players' mercurial emotions and this has allowed him to focus her powerful strokes on maximizing their effectiveness. 2014 AUS OPEN: Li Na Wins 2nd Major Title! 2014 OSCARS: Actual Nominations List! 2014 AUS OPEN: The Draw Is Released!